I spent a couple of months talking myself into participating in a Shakespeare challenge hosted by Adam at Roof Beam Reader, but then he decided not to host it after all. 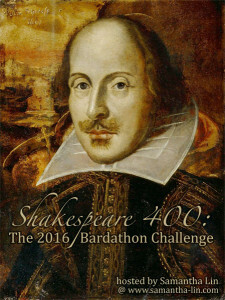 At first I was relieved, but then I was disappointed so I found another Shakespeare challenge. This one is hosted by Samantha Lin and has several different ways in which you can participate. You can read all the comedies, all the tragedies, watch performances, perform in plays yourself, and various other options listed here. I'm going to do the Mix-and-match option. I plan to read two comedies, two tragedies, and watch a performance. I will, of course, post here about my progress throughout the year. The reason I want to participate is because I really don't like Shakespeare, but my feelings are based entirely on Romeo & Juliet and Antony & Cleopatra. By the end of 2016 I plan to either have a newfound appreciation for Shakespeare, or actual justification for disliking his work. For tragedies, I plan to read Hamlet and Macbeth. I haven't yet decided on comedies but I'm open to suggestions. What is your favorite Shakespeare play? Are you participating in any challenges for 2016? In addition to the ones I suggested, you might like Comedy of Errors just because it's short. But more seriously, it uses plot devices that Shakespeare in many of his later plays: separated siblings, mistaken identity, puns/wordplay. It doesn't have a lot of emotional or philosophical depth, but then again, it's a comedy: Shakespeare wrote it to make people laugh.